A corn is a type of callus that can form anywhere on the foot. Typically, corns grow because of friction or pressure. People can get corns on any part of the foot that protrudes. Repetitive action causes skin to thicken and grow in hard layers. Possible causes of corns can be poorly fitted shoes, walking barefoot or not wearing socks. For the most part, a corn is harmless, but they can cause great discomfort on places like the bottom of the foot. Treating a corn takes time and requires you to remove the source of the friction. Soak your foot in warm, soapy water. Use a mild cleanser if you have sensitive skin, otherwise any soap, even dish soap, is fine. Soak for five to 10 minutes. Place a towel on the floor to catch flaking skin. Set your wet foot on top of the towel. Rub over the bottom of the foot with a pumice stone, focusing on the callus. This will scrub off the hardened layers of skin. 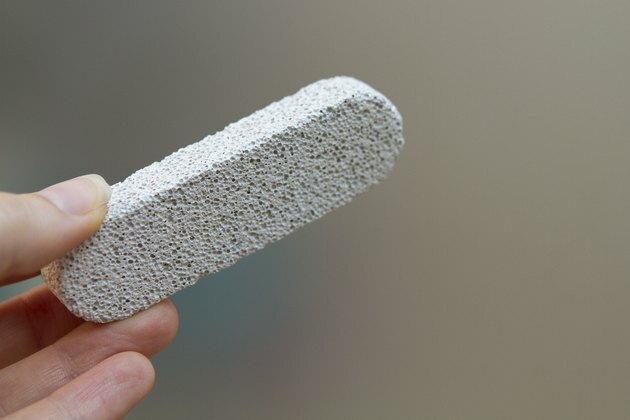 Do not use a pumice stone if you have an infection or are prone to them. Apply a lotion or cream to the affected area. This will soften the skin and keep the corn from cracking. Use a pad to cover the area such as a self-adhesive gauze bandage. MayoClinic.com warns against applying corn removers or medicated pads since they contain chemicals that can irritate skin. Remove the source of the pressure. For instance, if you wear shoes without socks, start wearing socks to reduce friction. Never try to shave off a corn. This will break the skin and might result in an infection. Diabetics are at high risk of infection because of circulatory problems, especially in appendages such as the feet. Corns or calluses that develop on the feet of diabetics require medical treatment. Attempting to remove the corn on the bottom of the foot of a diabetic might result in a sore that will not heal or might develop into a life-threatening infection such as gangrene. Is Corn High in Protein?